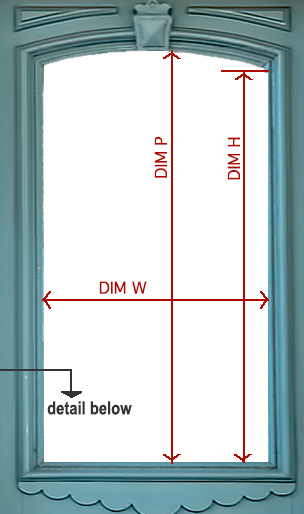 Overall dimensions can be adjusted to fit your opening. Custom combinations and rearrangement of design elements may incur a design charge. THIS FORM IS FOR ESTIMATES ONLY. We will email a layout and actual price to obtain approval before any work is done. Refer to standard patterns by description under large photo. Phone if you have questions. This page for ORDER INQUIRIES ONLY	:: Please use the Contact Page for all other inquiries. The panel's fit depends on you providing accurate dimensions of your opening. Please measure your opening following these instructions and referring to the above illustrations. Enter the dims in the boxes corresponding to the drawing. Enter fractions like this: 2 1/2 etc. We need the width - W, height- H, and peak - P height (if arched) of the opening. This are the "clear opening" dimensions. 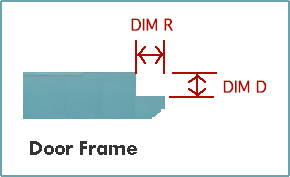 We also need Dim R and Dim D where the panel sets into the frame. If you have any confusion about measuring, contact us.